If there’s anything, internet users agree with, then it’s the fact that everyone hates to be spammed. From unsolicited emails to iMessages and other forms of spam, no one enjoys them. They can be frustrating, occupying storage space and in other instances, leading to a virus attack. This usually happens when there’s no filter in place to sieve/delete what’s legit and what is spam. 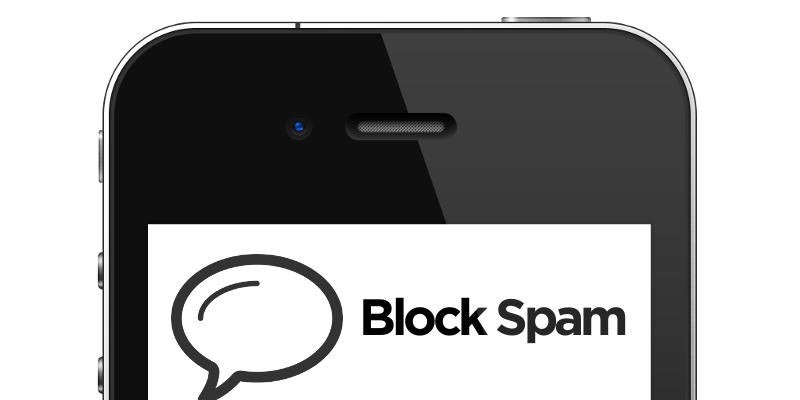 To this end, this article seeks to show the different ways you can block out spam on your iPhone. There are also many ways to deal with junk mails even without an iPhone spam filter, the following steps are ways of blocking mails sent from unknown persons. Log into the desktop version of your mail account from where the junk mail was sent. This can be Gmail, Yahoo mail, Hotmail, etc. The reason for doing this is that iPhone does not provide a means to block spam mails from your individual mail apps, you will therefore need to log onto the desktop version to block them. Open the message that the person sent you. Click on the options arrow and then select “Block ‘this Person’”. All mails coming from this person will be blocked and won’t find their way to your inbox. You can also block junk emails from your iCloud by using the Mail rules. This is also another way you can filter spam directly from your iPhone, without logging into your desktop. This feature is however available on iOS 8 and above. Go to the Settings button on your iPhone. Click on Messages to open the Message Menu. From this menu, slide the “Filter Unknown Senders” to turn it on. This will block messages coming from people who are not in your contact list from getting into your inbox. Search through the iPhone to identify spam and junk files and help users delete them. Some apps can prevent new spam mails from getting to the inbox. learn from the user’s patterns and choices to improve the spam sieving process. Give daily reports (or as set by the user) of the nature, type, and number of spam emails it has blocked within that period. Allows users selectively delete the files they want to delete. iMyFone Umate Pro combines technology and user-targeted design to provide a comprehensive app that helps users delete and manage spam, as well as deal with other forms of junk and temporary files. Spamdrain combines machine learning with intuitive and sleek design to provide one of the best spam filters out there. The app has a 14-day free trial, so be sur to check it out. Use this app to block phishing and other malicious emails through advanced filtering and mail blocking. Apart from junk mails, there are also many other hidden junk files on iPhone. These junk files continue to accumulate and will occupy much iPhone space, affect the iPhone’s performance and even make it run slower. There is also available spam filter for iPhone, that can help you clean up junk files from your iPhone. The iMyFone Umate Pro or iMyFone Umate Pro for Mac is one handy tool in helping to release space used by junk files. This tool acts by removing files that are redundant, such as app caches, corrupted files, cookies, crash logs etc. And it will do all of this for FREE! iMyFone is trusted by thousands of users (every year) and reported by well-known media around the world. It's fully compatible with iOS 12 and older versions. This iPhone spam filter app is handy in cleaning out these useless junk files, but that's not all. Not only does it help in filtering out junk files, but also helps in erasing all trash files that you have deleted in the past, including deleted messages, WhatsApp messages & attachments, photos, videos, call histories, notes etc. Erasing previously deleted files is necessary, as the files simply deleted on iPhone will still exist on your iPhone, though they are invisible. These files will eat up your iPhone storage and they can be easily recovered by data recovery tool. So if you have deleted some sensitive data, to avoid privacy leak, you'd better permanently erase them. The data erased by Umate Pro cannot be recovered with the latest recovery tool. This software scans your iPhone device for all junk and trash files. And suggests some of these which you will go through and approve their removal. You just need to follow the simple steps below to filter iPhone spam files and delete them. Step 1: Download and run the program on your PC/Mac and connect your iPhone to it. Step 2: Choose "1-click Free Up Space" tab to filter and clear up iPhone junk files. Step 3: Choose the "Erase Deleted Files" tab to filter and erase iPhone trash files. After this is done, the app will successfully delete these files, and thus help in clearing up space and improving iPhone performance. This handy software is available for use not just for your iPhone, but for all your iOS devices as well. 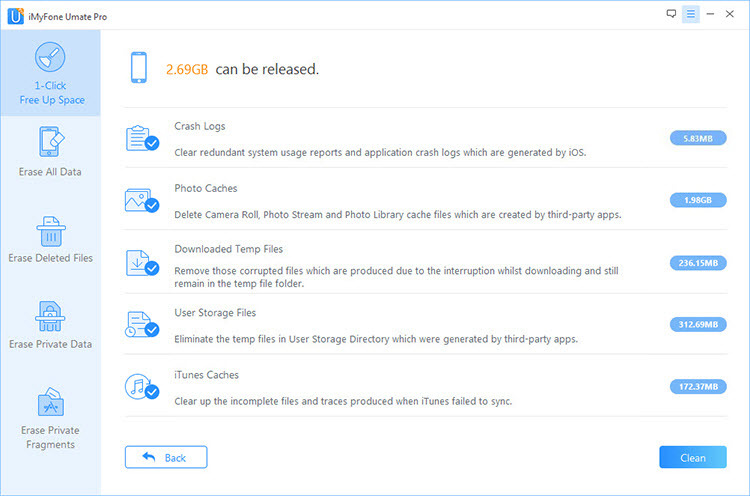 Clean up temporary files - Delete downloaded temp files, user storage files or corrupted files to speed up iPhone. Delete & Export Photos/videos - Delete & Export your photos/videos in bulk to recover huge iPhone space. Compress photos - Losslessly Compress iPhone photos to reclaim 75% of your iPhone photo space. Auto backup iPhone data - Before deleting or compressing, it will automatically back up original photos and videos to PC . 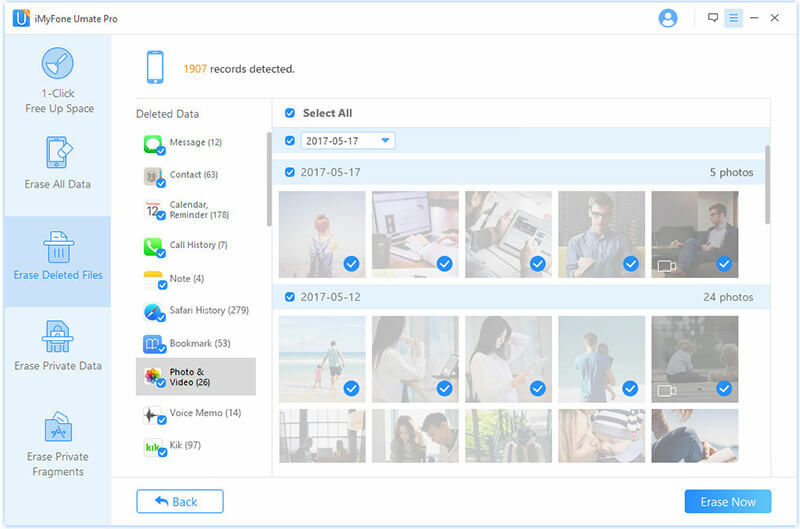 Erase private data - Permanently erase personal messages, photos/videos, call histories, WhatsApp/WeChat messages & attachments etc., 100% unrecoverable. Erase private fragments - Erase third-party Apps' fragments without any sensitive trace leaving. Supported Apps: WhatsApp, WeChat, Snapchat, Kik, Instagram, YouTube, Skype etc.